PORTLAND, Ore. (CNS) — In addition to serving tangy “banh mi” sandwiches and meat-laden noodle salads, Christina Nguyen’s food cart is her little orange monastery. 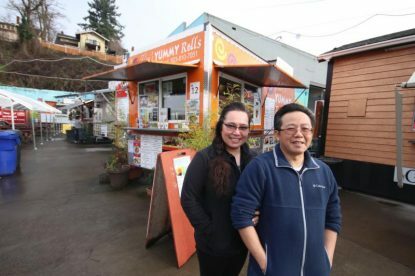 “I treat every single customer of mine as Jesus coming to my window,” said Nguyen, a member of Our Lady of Lavang and St. Rose parishes in Portland, Oregon, just up the hill from one of the city’s many food cart pods. Nguyen is one of hundreds of immigrant entrepreneurs who have built Portland’s famous and chic trailer dining culture. This class of small-business owners is hard working, creative, enterprising — and often utterly reliant on faith. Nguyen, 50, and her husband, Vinh, have worked vast hours in the five years since they began Vivi’s Yummy Rolls in a small orange trailer. They have not hired help in part so they can afford Catholic education. One child is at St. Rose School, the other at Central Catholic High School. Despite the tight budget, they often give food to people in need. Christina, who came from Vietnam to the United States in her early 20s, became Catholic in 1994. Over the past decade, her faith skyrocketed. She has positioned a crucifix in the cart so customers see it, and diners often confide their troubles in her, and on the spot she lights a large votive candle as a sign of prayer for their cause. She attends daily Mass before starting a day at the grill. “Jesus gives me strength to go through my difficulties and he gives me the grace to deal with what I have to deal with in my daily life,” she said. She chose Dec. 8, the feast of the Immaculate Conception, to start the business, asking Mary’s ongoing guidance. On fine weather days, they barely stop, welcoming almost 100 customers. Often, they serve only a handful. 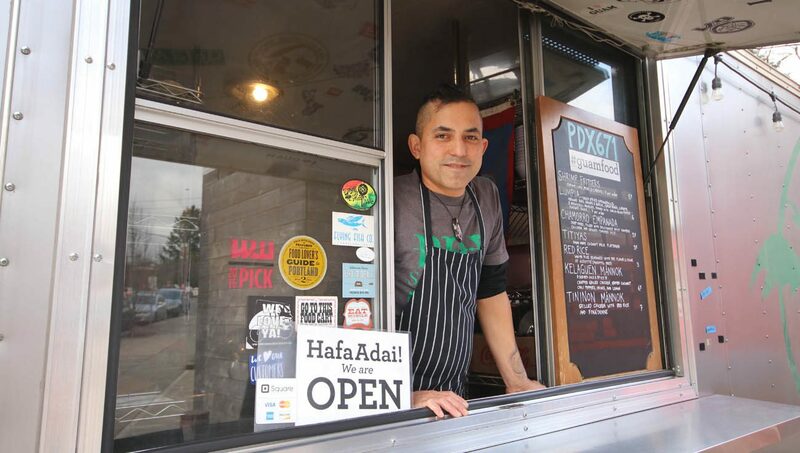 Joseph Kortbaoui is a dean of Portland food cart owners. He fled Lebanon as a youth during the country’s bloody civil war and became a mechanic and electrician on the East Coast. He moved to Portland and found such work limited, but the food cart business was surging. He used his know-how to build and sell the kitchens-on-wheels. He saw how well his clients were doing and built himself a cart. He has owned several since, serving pizza, cheese steak, barbecue and smoothies. 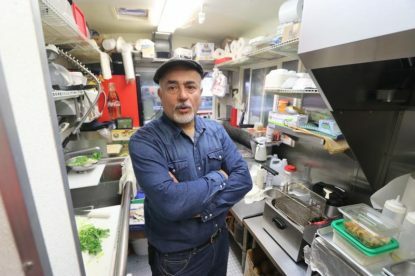 A member of St. Sharbel Parish in Southeast Portland, he began serving the Mediterranean food of his homeland six years ago from a cart he calls Yaba Yabaa, a kind of elated cry of dancers. He knows the trials of food cart life: 16-hour days, dependence on weather, continual menu updating, ruin at the caprice of lot owners. “Low business or missed operation or any other kind of problem could throw you in the street,” he said. Faith, he said, has made endurance and success possible. The numbers “671” make up the telephone area code for Guam. “PDX” is the airport code for Portland. Ed Sablan calls his cart serving Guam’s food PDX 671. Though he left his island homeland just after graduating from an all-boys Jesuit secondary school to study art and music in Portland, 42-year-old Ed Sablan still gets homesick. On Guam, family bonds and Catholic faith are life’s main ingredients. “Realizing the impact that you are making in other people through the foundation of faith and family really helps you to keep on going,” said Sablan, who works day in and day out so he and wife Marie can send their children to Catholic schools. The family, which belongs to St. Charles Parish in Portland, opened PDX 671 in 2010. He is the first Oregon creator of Guam cuisine, which relies on seafood or meat, coconut milk and unique island spices that offer a mild smokiness. His are family recipes. On occasion, Sablan offers jubilant pop-up dinners — one-night meals in a building in a trendy district. For Lent, Sablan was offering plenty of seafood selections for those abstaining from meat. When Mathilde Aurelien Wilson arrived in Portland four years ago, she could not find her native Haitian fare — not even a Caribbean meal. So more than 18 months ago, she started a food cart offering Haitian specialties such as oxtail soup and curried goat. At Mathilde’s Kitchen, the less adventurous can try chicken or her mild, crispy fried plantains. Aurelien Wilson is a force of nature. She attributes her character and strength to Catholic schooling in Haiti. “We had good discipline: Be on time, always clean — your nails, your hair, your white shirt. It’s not just like we could play any type of bully in class. Everyone was well behaved. I appreciated that … now I feel that respect for others is all I like.” She learned to share; children who had no lunch got food from classmates. Her generosity has continued. Though her cart has not made her rich, Aurelien Wilson sends money to an impoverished Haitian village for a school and feeding program for children. “I can sleep better thinking today that wherever that money goes, some family is going to have a meal tonight and a kid is learning,” she said. Langlois is managing editor of the Catholic Sentinel, newspaper of the Archdiocese of Portland.